Have additional questions? Please visit QuikTap FAQs. This device uses a high pressure refillable CO2 cylinder. Caution must always be taken when using high pressure equipment. Improper use, filling, storage, or disposal of co2 cylinder may result in property damage, serious personal injury, or death. QuikTap labeled cylinders are food-grade. This means that the inside has been thoroughly cleaned of debris and machining oils making them safe for dispensing beverages. Do not use any other brand cylinder. Do not use this device for any other purpose than as mentioned in this manual. Do not attempt to modify this product without the assistance of a certified professional. Always use caution when handling pressurized cylinders. Keep all cylinders out of the reach of children. Never point cylinder towards someone’s face. Store cool and do not expose pressurized cylinders to heat exceeding 130F. Cylinders that have been exposed to fire or heated above 250F should not be used. Only use appropriate gas as marked on the cylinder. The CO2 cylinder should be inspected and hydrostatically retested by a DOT licensed requalifier at least every 5 years. air smith. Cylinders must be filled only by properly trained personnel. Do not overfill the cylinder! Never exceed the capacity as marked on the cylinder. Never expose to corrosive materials. Do not use caustic cleaners or strippers on the cylinder or tank valve. The brass valve is intended to be permanently attached to the cylinder. There have been reported incidents of users unknowingly unscrewing the valve from the cylinder. A pressurized cylinder can fly off with enough force to cause serious injury or death if the valve unscrews from the cylinder. Always make sure the valve and cylinder rotate together when removing from the regulator. If your cylinder is not already marked, use paint or nail polish to mark the positions of the valve and cylinder. When removing cylinder, observe these marks to make sure they stay aligned. Proper care and maintenance must be used to ensure proper function and safety. This device uses liquid CO2. Make sure to turn the regulator to the off position when not in use. It is not recommended to remove cylinder from regulator unless empty as liquid CO2 can spray out causing freezing burns. Exterior of cylinder may be come frozen. This is normal, but do not touch the cylinder with bare hands. Only use this device with the cylinder in an upright position. Congratulations on purchasing your QuikTap! We guarantee that you will be satisfied with the convenience and performance of your new tap. The preserving effect of C02 alone will easily justify your investment. As a brewer and brewery owner, our mission is to put quality beer into the hands of the consumer. That mission doesn’t end until the beer is in your glass. We believe the quality and cleanliness of our serving equipment is just as important as the recipe itself. It would be a shame for all of the time and effort to be wasted on the last short journey from the keg to your glass. 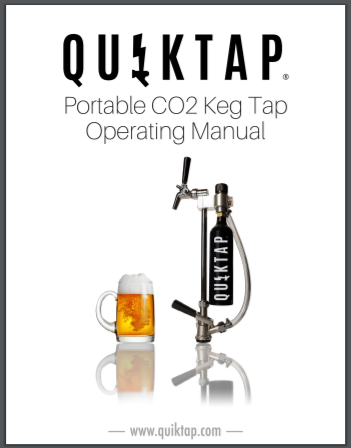 With the countless beer festivals, parties, and tailgating we’ve participated in, we needed a CO2 tap that was truly portable and economical. We created the QuikTap to solve this very problem. No more trade-off between convenience and quality. 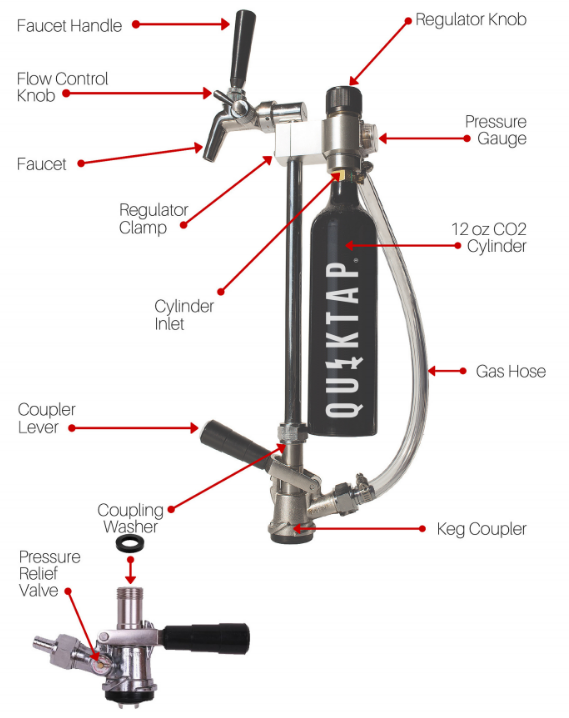 With a QuikTap, your beer will stay fresh and carbonated for as long as the date codes set by the brewery. You can now preserve an unfinished keg and tap again at your convenience. With proper use and care, you should get many years of enjoyment out of your new tap.